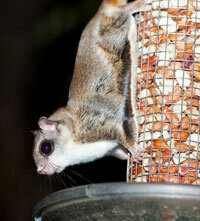 Southern Flying Squirrels are very small Squirrel with very silky brown fur above and white fur below on his belly. Its 7.3/4 – 10 1/8” long and weights1 ½- 3 ½ oz. It mates in early spring and has a litter of 2-7 young. All flyers are nocturnal and very social squirrels.